Dylan Bradford threw two interceptions in the Senators road SOC loss to Waverly Friday night. 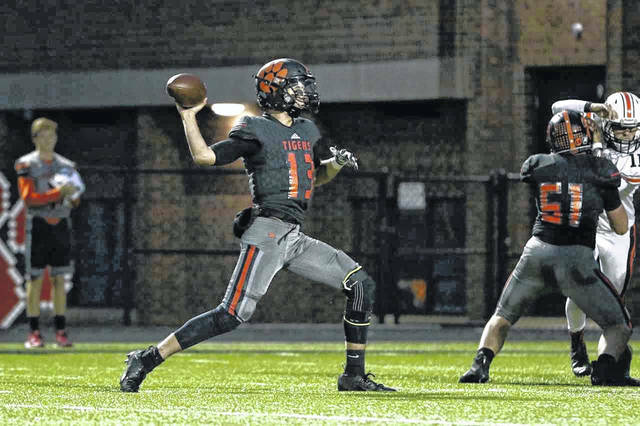 Haydn Shanks threw for 285 yards and 4 touchdowns in the Tigers home victory over Portsmouth West Friday night. The Waverly Tigers returned to their regular offensive form Friday night as they were able to defeat the Portsmouth West Senators, 35-19. On the Tigers first drive of the game, they were able to move the ball down the field before being forced to try a 32 yard field goal attempt which would give them the 3-0 lead with 7:37 left in the first quarter. West moved the ball efficiently until Dylan Bradford fumbled the ball on a 3rd and 7 attempt from the Tigers 24 yard line. After the forced turnover, Waverly was able to gain three first downs before quarterback Haydn Shanks found wide receiver Phoenix Wolf for a 28 yard touchdown pass to give Waverly the lead 9-0 after the missed extra point. Garrett Hurd’s longest carry of the night went for 43 yards to the Tigers 12 yard line on the Senators next possession. On the following play, senior playmaker Josh Berry took the end around handoff around the edge of the Waverly defense for a 12 yard touchdown rush with 9:34 left in the second quarter, cutting their deficit to 9-7. That two point deficit wouldn’t last long, however, as Shanks was able to find wide receiver Cobe Marquez in the end zone for a 34 yard touchdown pass to extend Waverly’s lead to 15-7 with 8:47 left in the second quarter after their two point conversion attempt was unsuccessful. The Senators were not able to do anything on their ensuing possession, forcing them to punt the ball. 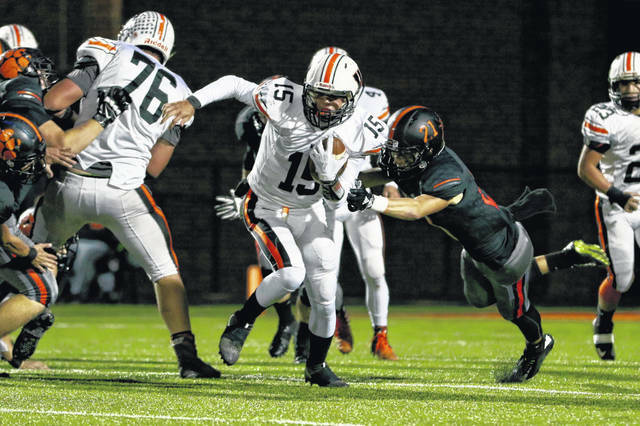 After forcing the Tigers to punt after a three and out offensive series, Trevor Staggs was able to recover Waverly’s Payton Shoemaker’s blocked punt and take it into the end zone to cut their deficit to two once again at 15-13 after Garrett Hurd was denied close to the goal line on the two point conversion attempt. Three and outs from both teams on their upcoming possessions gave Waverly the ball on their own 31 yard line with 1:28 left in the first half. After a pass interference call set up the Tigers on the Senators side of the field, Shanks was able to find Phoenix Wolf’s brother, Easton, for a 42 yard touchdown strike to extend Waverly’s lead to 22-13 after the made PAT with just 23 seconds remaining before the halftime whistle. Coming out of the half, Waverly was able to force the Senators to punt from midfield. Attempting to extend their lead, Waverly assumed possession at their own 14 yard line. Two plays after fielding the punt, Shoemaker found a seam in West’s defense which allowed him to rush 68 yards for a touchdown to give his team the lead at 28-13 following the failed two point attempt with 8:07 left in the third quarter. A few punts later and West had an opportunity to narrow the gap as they took over on the Waverly 36 yard line. A solid offensive drive was capped off with a Dylan Bradford quarterback sneak from the 1 yard line to cut Waverly’s lead to 28-19 with :31 seconds left in the third quarter after the missed PAT. Waverly received the ball on the ensuing kickoff and did what they do best: get the ball to their playmakers. After a long sustained drive, Shanks once again found Easton Wolf for a touchdown, this time from 27 yards out to give Waverly the 35-19 lead with 9:43 left in the game. Shanks finished the game 17/26 with 285 yards passing and four passing touchdowns. Easton Wolf led all Waverly receivers with six receptions for 149 yards and two touchdowns. Neither side was able to put points on the board in the final nine minutes of the contest, sealing the Senators fate as they were dealt their second loss of the season.